The risk of U.S. protectionism is real and could get a lot worse, says Morgan Stanley’s Emma Lawson. 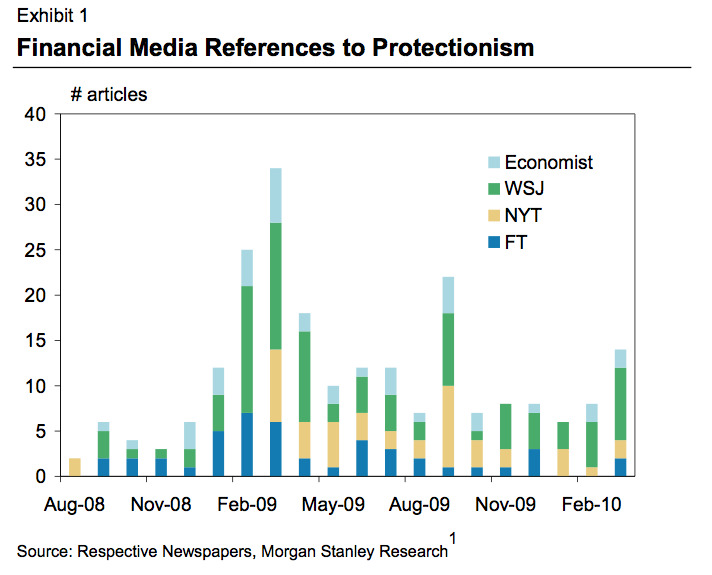 To highlight the increased attention on trade disputes we have tracked the use of the term protectionism in the financial media. Exhibit 1 shows a sharp increase in articles on protectionism at the beginning of 2009, and a steady rise again in the last few months. 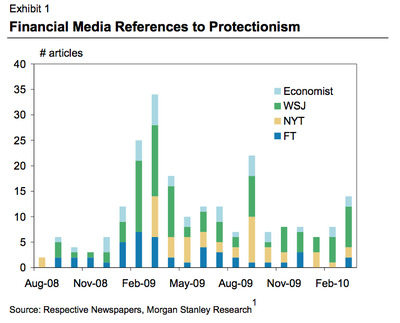 The incidence of articles is also now broader across the financial media covered. While the latest rise does include the China-US issues, it also includes defence, footwear and agriculture in various countries. We would suggest that the problem is more wide-spread than just the US-China debate and thus any extension or escalation may have a broader currency implication. What does it mean for currencies? Morgan Stanley thinks that if the U.S. applied tariffs on Chinese goods, then currencies of countries that rely on Chinese growth could be slammed. Such as the Aussie and New Zealand dollar. We’d guess the Brazilian real might not do so well either. The effect on the USD is ambiguous in the near term. In the short run trade protectionism can be positive for large economies, and if markets believe that this will address the structural imbalances, then the USD may appreciate. If prolonged, the USD is likely to face headwinds. A safe-haven is likely to be CHF. The Norwegian Krone might another haven, but perhaps lacks the franc’s liquidity.